Machine learning and deep learning have gained attention from the development community as a technique that provides enhanced intelligence to many vision based applications (Autonomous cars, field drones, surveillance cameras) including Embedded Vision. Xilinx designed the stack to enable a much broader set of software and systems engineers, with little or no hardware design expertise to develop, intelligent vision guided systems easier and faster. Xilinx’s reVISION™ Stack removes traditional design barriers by allowing you to quickly take a trained network and deploy it on Zynq SoCs and MPSoCs for inference. What is Xilinx reVISION™ Stack? The Xilinx reVISION™ stack includes a broad range of development resources for platform, algorithm and application development. 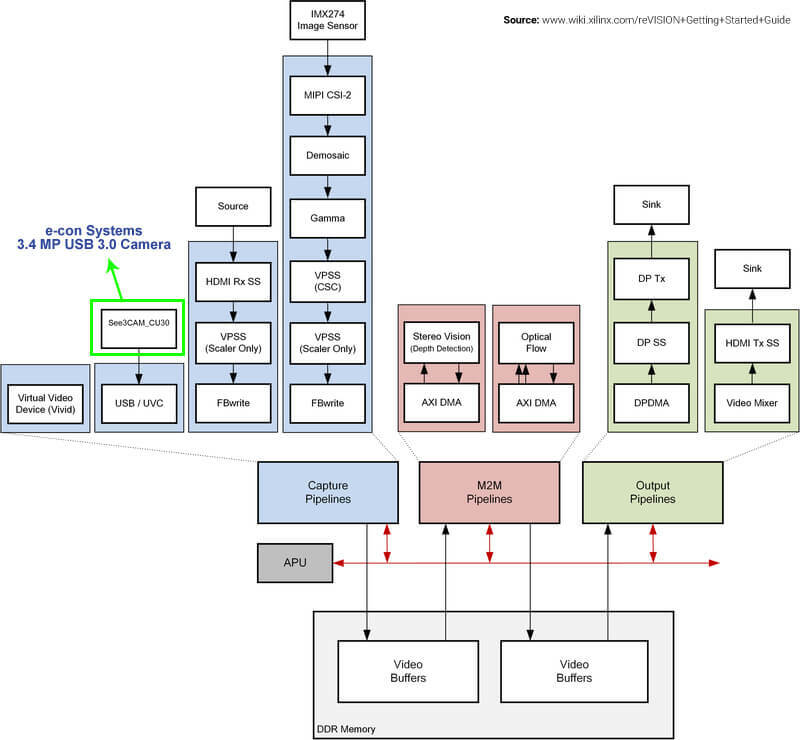 Why See3CAM_CU30 on Xilinx reVISION™ Stack? Xilinx has showcased their reVISION™ algorithms capabilities by using the Dense Optical Flow application. For Dense Optical flow algorithm they need high performance data like 1920*1080 @ 60 FPS uncompressed. For that they had chosen our USB 3.0 UVC camera( See3CAM_CU30 ) which can output 1920*1080 @ 60 FPS in uncompressed UYVY data. Xilinx also included the design example which uses e-con’s See3CAM_CU30 camera for the Dense Optical flow application evaluation. With our camera the users get the advantage of evaluating the existing design examples on the Xilinx ZCU102 platform. See3CAM_CU30 is an ultra-low light USB 3.0 camera based on 1/3 inch, AR0330 CMOS image sensor from On semiconductor. It is an UVC compliant camera it doesn’t require any special drivers to be installed. It supports 1080p @ 60fps in uncompressed UYVY format and it has an integrated high-performance Image Signal Processor (ISP) that performs all the Auto functions (Auto White Balance, Auto Exposure control). The ISP and sensor settings have been fine tuned to generate best-in-class video in both uncompressed UYVY and Compressed MJPEG.